The tesseract Red Skull (from Captain America) fell into the ocean when Steve Rogers, aka Captain America (Chris Evans), crashed. It was recovered while Howard Stark was searching for him. Nick Fury (Samuel L. Jackson) and S.H.I.E.L.D. is using it as a gateway to funnel limitless power from space. What Nick and his team don’t realize, is that the tesseract opens a portal through which Loki (Tom Hiddleston), Thor’s (Chris Hemsworth) brother, comes to retrieve the power source. After “possessing” Hawkeye (Jeremy Renner) and Dr. Selvig (Stellan Skarsgård), Loki takes the tesseract and begins building a stable portal to allow the army he has teamed with to come take over Earth. Fury, against the council’s orders, assembles his Avengers Initiative to find the tesseract and save Earth. 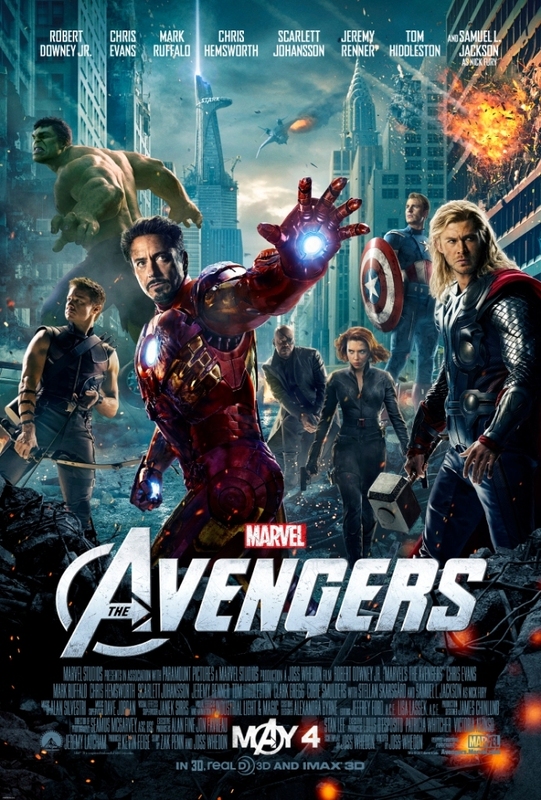 The team includes Tony Stark/Ironman (Robert Downey, Jr.), Natasha Romanoff/Black Widow (Scarlett Johansson), Dr. Bruce Banner/Hulk (Mark Ruffalo), Thor, and Clint Barton/Hawkeye, who is now working with Loki against his will. The Avengers all have their history with each other. And, being the unstable personalities they are, they don’t get along as well as everyone would hope. Will they be able to pull together as a team and save Earth from the oncoming invasion? Let me start by saying that I have been waiting for this movie pretty much since the first Ironman movie came out. That means basically 4 years of hype building up to this moment. It’s nigh impossible for a movie of any sort to live up the expectations that have been placed on it. Rest assured. The Avengers delivers everything you had hoped it would. And then some. This movie is nothing short of amazing. As far as graphic novel/superhero movies go, this is as close as you can get to perfection. (You’ll have to excuse me for gushing over this movie. But it is well deserved.) I mean, you have the best superheros combined. Action. Humor. Samuel L. Jackson. 3D ScarJo. What more could you ask for? There is such great chemistry between the actors and their characters. The back and forth between Stark and Banner is hilarious, and so fitting with their characters. On top of that, there is enough humor thrown in to make it incredibly entertaining and let you know that both the movie and the characters don’t take themselves too seriously. But it stops short of making the movie cheesy and ridiculous. The action scenes are intense without becoming too busy and overcrowded. The clashes between the members of the Avengers team are great. Again, action packed and funny enough, without going overboard. You have to see it in 3D. A movie this epic deserves the treatment. And it is as well done as every aspect of the movie. I must say, however, that I prefer “regular” 3D to IMAX 3D. I like the concept of IMAX 3D and it’s huge format. But if you turn your head wrong, you lose the 3D and just end up with double images. This is the only negative thing I can say. On the way out of the movie, I heard a lady say, ” That was the longest 1hr 20min of my life.” Which isn’t surprising, considering the movie is about 2.5 hrs. I also heard a kid say, “It was ok. Nothing special.” I have to wonder if they saw the same movie I just saw. Because neither of those are true. Even at 142 minutes, I was never once bored or wondering when it would be over. All I can say is simply amazing. Well done, Joss Whedon. Well done. My only fear is that you’ve set the bar so high, you may not be able to live up to it in the future. You will definitely want to check out The Avengers. Even if you’re not a fan of the genre, go see it. It just may change your mind.